Have the Rats Returned to Tompkins Square Park? Stephen Rex Brown Special delivery last summer. It was the story of last summer: First the hawks came to Tompkins Square Park and then came the rats. A media feeding frenzy ensued and before long, there was a movie trailer. The park department fought back with minty trash bags and high-tech compactors, and eventually started planting poison again. Earlier this year, parents declared victory over the playground infiltrators, but now a reader uses the Virtual Assignment Desk to tell us – rats! – they’re back. Continuing story. 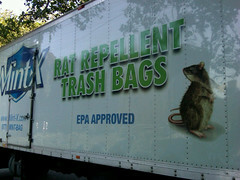 Efforts to reduce the resident rat population haven’t helped. The local hawks grow fat on unpoisoned rats, but kids and caretakers in the Avenue A playground and the garden alongside the E.10th Street pool must share the playspace with fat and happy rats. Anyone can see that the baited boxes are too few to dent the population. Why can’t these rodents be gassed? Have rats returned to the park, like at Rat Alley? Volunteer to be our rat-porter at the Open Assignments page (filter posts by “Pitch” to see the submission above). Add photos to our Flickr pool. E-mail us your most hair-raising video footage.